The aim of the S-Mobil-100 project is to use seamless mobility chains to sustainably expand the action areas of the 60+ generation. Various gerontological, social and organisational concepts are used to develop age-appropriate technical prototypes that expand the required information and communication media and meet the mobility needs of the 60+ generation. Older people should be supported by building an age-appropriate community platform with multimedia access and by integrating existing mobility and service infrastructures. 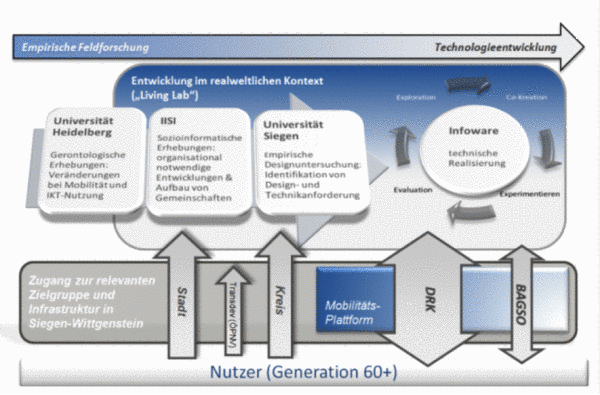 Generation 60+ users are directly involved in the planning, development and evaluation of the new mobility services in the form of Living Labs. Cooperation with other providers, e.g. taxi companies, bus companies, janitor services. The IISI is responsible for socio-informatic needs assessment and evaluation within the project. We also support the Living Labs. German Red Cross District Association Siegen-Wittgenstein e.V.